PhotoTangler Collage Maker is a powerful image utility that instantly turns your favorite photos into beautiful collages! It’s easy, fun, and the results look like magic! Anyone can get great results with this application, even with no graphics experience. 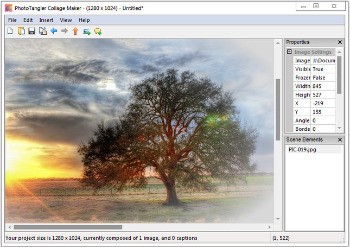 Unlike many other collage makers out there, PhotoTangler does most of the hard work for you. Instead of getting caught up learning the technical details of a program, you can focus on making gorgeous photo collages! Just drag-and-drop photos on the canvas, and it beautifully blends them together with any other photos nearby. The dreamy effect is hard to describe, but we’re betting you’ll see the creative potential the moment you try it!